Have you ever needed a gift at the last minute and realized that you were pretty much out of cash? Here’s a great solution: go to the thrift store, find some cool plates and candle stick holders and make a DIY cupcake stand! This is also a great stand for cookies, or even someone in your life that has lots of beautiful jewelry. This took me a total of 15 minutes to put together. And after the drying time for the spray paint, it was ready to be packaged by the next day. Here are the items I picked up at the thrift store. The candle stick holders were 50 cents each and the plates were 99 cents each. The big one on the bottom is actually a plate from a microwave! I decided to get a small bowl for the top instead of a small plate as a place to put small cookie bites, candies or small earrings(for the jewelry lover). The bowl cost 79 cents. For this project, you’ll want to use E6000 super glue. I found mine at Hobby Lobby and used a 40% off coupon to get it for around 2.40. To prep your items, put a thin layer of glue on all parts that will be connecting together, which includes both sides of the candle sticks and both sides of the middle plate. Let the glue get a little tacky before you fuse the items together; it usually takes about 30 seconds or so. Put the items together, making sure everything is level and centered correctly. I placed some heavy books on top of stand to make sure that they stayed together, then let I let it dry for about 3 hours. 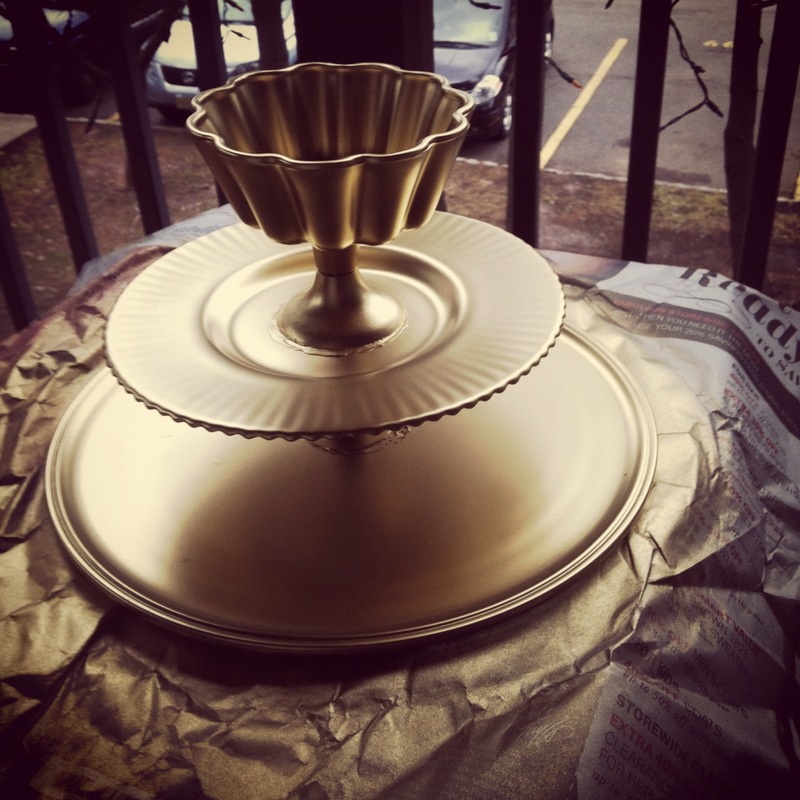 Once it dried, I set it up outside and spray painted it gold. You can use whatever color you want that will fit the recipient. I also added a coat of protective sealant since it’s going to be used with food, but that is totally optional. And that’s it! 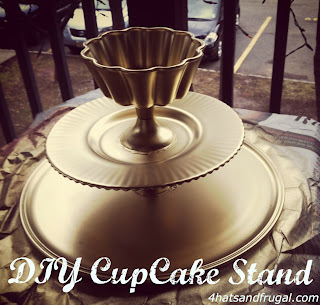 Total for this DIY Cupcake stand? 6.17, including the glue! This would also be a great stand to make with really small plates and used in a bathroom, but that’s another post. Ha! Now go out there and get crafting!